The TCL 55S517 vs LG 55UK6300PUE comparison demonstrates the difference between both devices, which were presented in the 2018 year. The first model belongs to the S517 series, which has a Smart Functionality feature and Ultra HD picture clarity. The second one relates to UK630 series and all its representatives have AI ThinQ and IPS technologies. 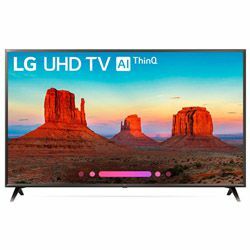 The LG TV is in a high price niche, while the TCL belongs to the medium price niche units. The TCL doesn’t have a local dimming feature, unlike the LG. The 55S517 is supplemented with a Micro Contrast option in a menu, but such a feature only adjusts the contrast. The HDR Peak Brightness is very low and all small highlights in dark scenes stand out, many of them are missed. The 55UK6300PUE has a mediocre Peak Brightness. I can see the glares in a bright room and the TCL device has a better protection against it. The difference between prices reflects in the Bluetooth presence. I want to compare the Bluetooth audio streaming, but the TCL doesn’t have such a feature at all. The LG presents amazing signal quality and I enjoy the voice control, which is not available on the 55S517. I can’t use the Parental control feature on the LG. There is an error message on the screen and the Home menu appears. The LG 55UK6300PUE vs TCL 55S517 collation demonstrates that both models have typical for their brand’s designs. The stands greatly support TVs but TCL’s details are longer. Such a peculiarity provides the stability to the device but, at the same time, doesn’t fit most of the tables. LG’s product doesn’t have such problems. The 55UK6300PUE is supplemented with thicker borders than the 55S517 has (0.75" versus 0.35"). The LG demonstrates better assembly quality because the TCL’s TV has some loose panels and gaps. I can easily connect the PS4 Pro to the TV. The picture is amazing and the sound is exactly what I expected. Menus switch quickly. The device has an amazingly fast response. I can’t easily hook up other devices to all the 3 HDMI. TV doesn’t see new connections on the first try. The audio is sub-par. I need the external sources to fully enjoy the sound possibilities. It stays cold even after heavy loads. The Roku app doesn’t produce a sound. It also can turn off arbitrarily. There are lacks in planning for cable management. I can’t reach the back inputs when the TV is wall-mounted.